No one was injured when a car crashed into concrete barricades at 218th Street and Indian Road on Jan. 7, 2013. INWOOD — A suspected drunken driver who walked unharmed from an Inwood Hill Park car crash Tuesday night giggled as he and a passenger surveyed the wreckage — then went to a nearby bar and ordered a beer, witnesses told DNAinfo. 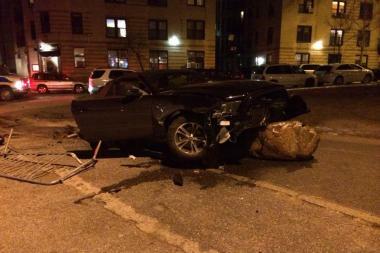 Dexter Stroude, 35, of Brooklyn, was arrested by police and accused of driving drunk after he sped down 218th Street, blowing through stop signs and crashing his black 2014 Ford Mustang into a large boulder at the park's entrance near Indian Road about 10 p.m., police and witnesses said. "It was obvious that there was going to be no time to stop," said Scott Bintner, 35, a lifeguard who was walking down 218th Street at the time of the crash. "It was just a matter of when they would try to stop and how bad it was going to be." Police said the car smashed into the boulder, slid on top of it and continued into the park before coming to a halt. As panicked onlookers ran to the scene of the wreck, Stroude and his two male passengers got out of the vehicle and began to laugh, witnesses said. "They were laughing, with no real concern to their safety," said Cole Thompson, who raced to the accident after spending the evening at Indian Road Cafe. In a video provided to DNAinfo by Thompson, one of the passengers marveled at the mangled vehicle, saying "That's a beautiful wreck." Thompson said that one of Stroude's passengers asked for directions to the Long Island Railroad and disappeared toward the subway before police could arrive. Stroude and the other passenger went across the street into Indian Road Cafe, where they asked for a beer. "I told them there was a cafe where they could warm up and they said: 'Do you think we can get a beer in there?'" Thompson said. "They certainly came in and asked for a beer. I heard that," added Bintner, who followed them into the bar. Indian Road Cafe bartenders didn't oblige, instead offering the passengers glasses of water, according to cafe staff. The passengers were transported by the FDNY to the New York Presbyterian Allen Pavilion with minor injuries. Stroude was arrested and charged with driving while intoxicated, police said. Stroude could not be reached for comment and information on his lawyer was not immediately available.